East Timorese Recall Santa Cruz Massacre Ten Years Ago That Marked Turning Point Inresistance to Indonesian Occupation | Democracy Now! The U.N. Security Council last week formally endorsed East Timor 's plans to declare independence on May 20 of nextyear, pledging that the United Nations will “remain engaged” in the world's newest nation. East Timor’s constituentassembly is writing the country’s constitution and preparing for the day they will run their own affairs. And inDili, residents are holding a ceremony, as they do every November 12, to commemorate the Santa Cruz massacre. Ten years ago today Indonesian troops massacred at least 270 East Timorese at the Santa Cruz cemetery in Dili, EastTimor as they engaged in a memorial procession and protest to honor the memory of a young man, Sebastio Gomez, slainby the Indonesian military. The Indonesian troops who committed the massacre used M-16 rifles provided by the US;their officers were trained and supported by the U.S. When the horrific reports of the Santa Cruz massacre reached the outside world, the response of the US and its allieswas instructive. The Bush Administration doubled military aid to Indonesia even as General Try Sutrisno, who wouldlater become Vice President, said of the nonviolent protestors “such people much be shot and we will shoot them.” Butthe massacre also sparked an international solidarity movement to support the East Timorese struggle for liberationfrom Indonesian occupation. 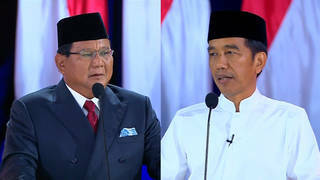 Here in the U.S. grassroots activists began pushing Congress to cut off training and military support for Indonesia,making slow but steady progress in spite of fierce opposition by the Pentagon, State Department and multinationalcorporations operating in Indonesia. In East Timor the resistance recovered and continued to grow, now led by young people and students who had spenttheir lives living under occupation. For East Timorese now awaiting independence in just a few months, it seemsalmost impossible that they could have traveled so far since that dark day ten years ago. Matthew Jardine, a writer on human rights issues. He is theauthor of East Timor: Genocide in Paradise and is currently writing a book on the making of “Ground Zero” in EastTimor in 1999. Constancio Pinto, former East Timorese resistance activist, now East Timor’s US Representative inWashington. Bela Galhos, East Timorese student activist who sought asylum in Canada. Returned to East Timor withCanadian troops in 1999. Bela now works for UN radio in Dili, East Timor, where she hosts a radio show on women’sissues.